When AMD set about bringing their CPU/GPU fusion initiative to life with the Heterogeneous System Architecture (HSA) earlier this decade, one point AMD made early-on was that while they strongly believed in the need for heterogeneous computing and the performance gains it would offer, they would also be pragmatic. When you’re attempting to significantly alter the computing landscape and create architectures that can accommodate massively parallel workloads just as well as they can traditional serial workloads, it means you have to address not only the hardware end of the equation but the software end as well. In other words it means you need an ecosystem, and you cannot build an ecosystem of one. To that end, in 2012 AMD founded the Heterogeneous System Architecture Foundation to serve as a neutral consortium to control the development of the HSA standard. Joined by co-founders ARM, Imagination, MediaTek, and others, the HSA Foundation would create the ecosystem necessary for HSA to succeed by creating a common standard for heterogeneous computing that multiple hardware vendors would implement. 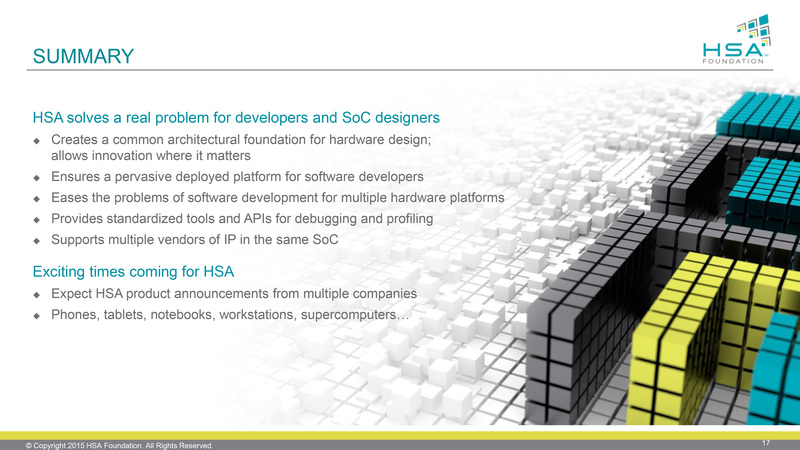 Software developers in turn could then write software targeting the HSA standard, allowing this software to work in a full heterogeneous manner across a wide range of hardware. 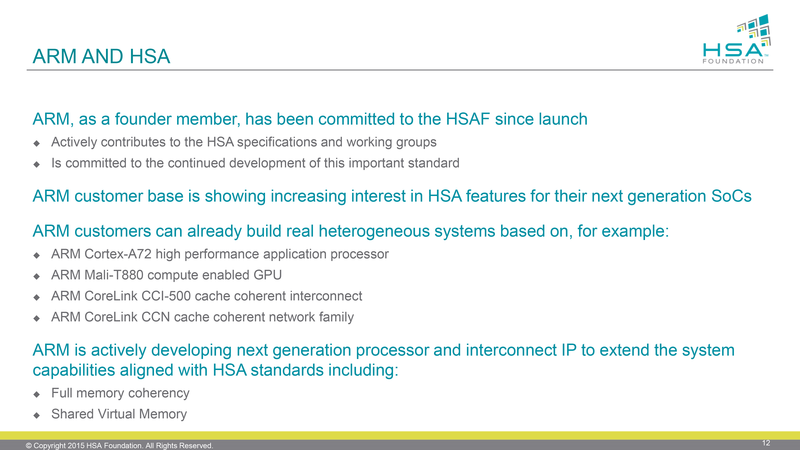 Meanwhile the fact that HSA was originally developed by AMD before being handed over to the HSA Foundation meant that while the major founders of the Foundation were all equals at the table, the timeline meant that the initial versions of HSA were to be spearheaded by AMD. AMD’s already-in-development hardware would be the first HSA-capable hardware to be released, and given the long lead times required for processor development, the other partners would be releasing their HSA designs later on, needing a full development cycle to integrate the technology. To that end the first pre-1.0 HSA hardware was 2014’s Kaveri APU, and the first 1.0 HSA hardware is AMD’s 2015 Carrizo APU. Jumping to the present, a bit over three years since the HSA Foundation was formed, the HSA Foundation is now preparing for the next generation of HSA products. To that end, the Foundation is presenting an update on the state of HSA implementations at this year’s Linley Processor Conference. With the release of Carrizo putting HSA 1.0 into motion, ARM, Imagination, and MediaTek are now discussing their own HSA hardware release plans in greater detail. This is both to demonstrate their continued support for the standard as well as to offer some further detail in how the HSA ecosystem will work in the future with multiple vendors selling products and potentially IP from multiple vendors all in the same SoC. ARM for their part is not yet announcing any specific IP or dates, but they are reiterating that they have HSA-capable IP in development. For ARM this means the company needs to develop both processor designs (CPU and GPU) that are compliant with HSA, but they also need to develop suitable a suitable interconnect that can comply with HSA’s memory sharing and coherency requirements, which in many ways is the core strength of the standard. 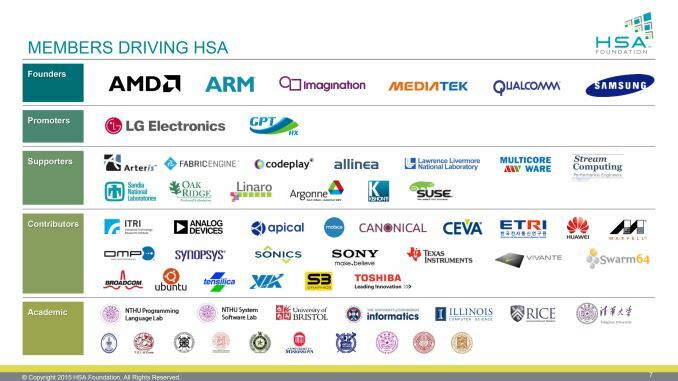 Meanwhile it’s interesting to note that although ARM isn’t at full HSA compliance quite yet, there’s a definite element of doing what they can within the capabilities of current hardware. Current ARM-based SoCs frequently already implement limited forms of heterogeneous computing, particularly when tapping the GPU for image processing (e.g. cameras). This is something ARM and other HSA members see as being an important stepping stone towards getting to full HSA compliance. Meanwhile SoC designer MediaTek is similarly reiterating the presence of HSA-enabled SoCs in their roadmap. 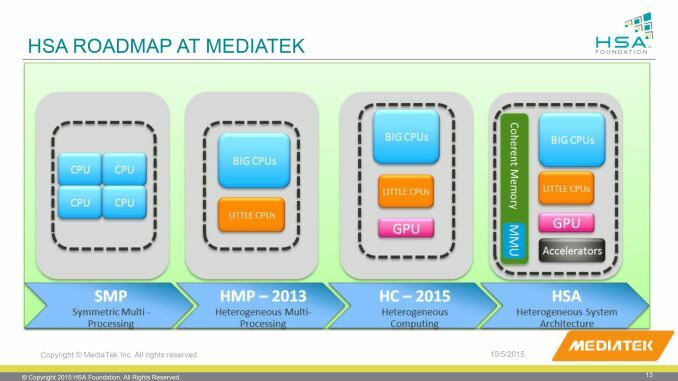 As one of ARM’s biggest customers, the plans of MediaTek and ARM go hand-in-hand – ARM supplies the IP, which MediaTek will then assemble into an SoC design – so at this stage MediaTek’s HSA plans essentially follow ARM’s HSA-complaint IP release schedule. In the meantime, like ARM, MediaTek is talking about how current SoCs and their more limited heterogonous capabilities are an important step on the way to full HSA. The final HSA member taking part in the Foundation’s presentation is Imagination. Like ARM, Imagination is a pure IP provider, and along with AMD’s x86 and ARM’s ARM, they provide the third CPU architecture supporting HSA, MIPS. 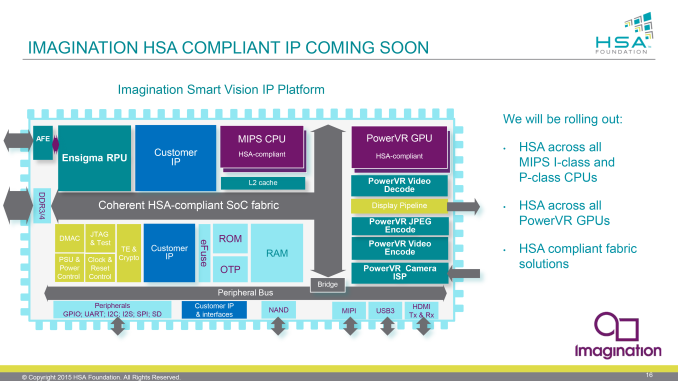 Imagination has HSA-capable designs in development both for their PowerVR GPUs and their I-class & P-class CPUs, further stating that “all” future designs for both lineups will support HSA. Imagination’s SoC interconnect/fabric is also being similarly updated to support the necessary memory coherency. Meanwhile Imagination is also the only other participant putting an ETA on their HSA-capable products. For Imagination it will be a gradual rollout as older products reach the end of their lifetimes and are updated, but the company expects to be releasing their first HSA-capable IP designs in 2016. With roughly a year required to go from IP to hardware, this means we would start seeing the first HSA-capable Imagination-powered hardware in 2017, assuming designs for the CPU, GPU, and fabric are all released in 2016. Imagination’s position as an IP provider better known for their GPUs than CPUs also brings up an interesting compatibility point that the Foundation is addressing, which is how HSA will work when multiple vendors are providing IP for use in the same SoC. 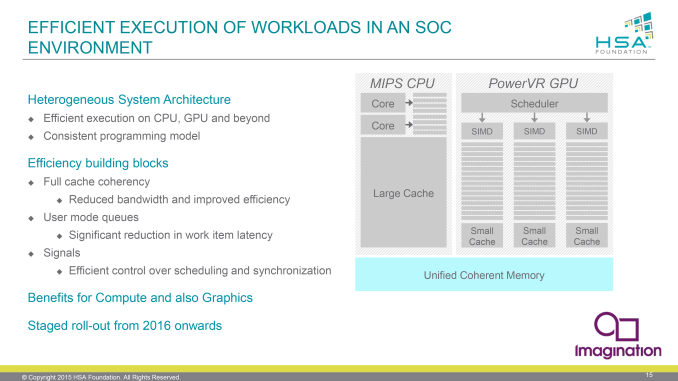 While a top-to-bottom ARM or Imagination solution is relatively straightforward, things get far more interesting mixing and matching, such as an ARM Cortex CPU with an Imagination PowerVR GPU, something that already occurs today with SoCs from multiple vendors. In short the HSA standard does account for this, and as long as all of the necessary components of an SoC are HSA-compliant, then it will be possible to put together an HSA-capable SoC mixing IP from multiple vendors. Ultimately it is the Foundation’s goal to not just see HSA prosper, but to see it deployed from the bottom to the top, mobile devices right on up to supercomputers. 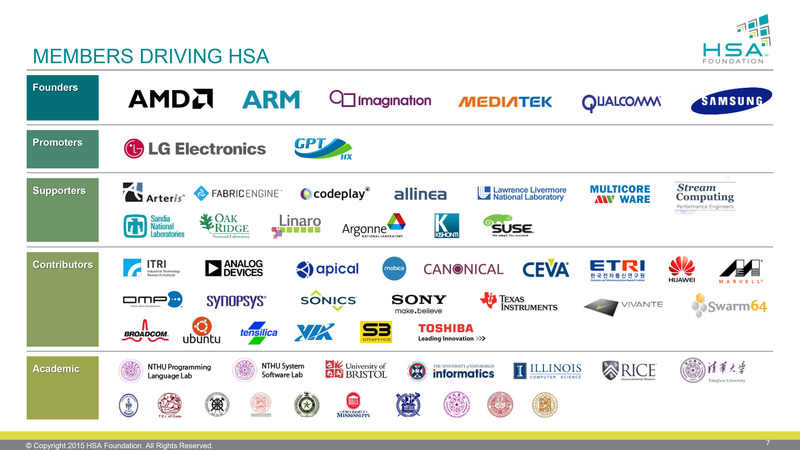 With that said, the bulk of the HSA founders are mobile firms, and it’s entirely likely that outside of AMD’s APUs we’re going to see the mobile market take off first. Though with mobile platforms being the ultimate power-constrained platform – you don’t just need to be efficient to use power wisely, but you have a finite battery capacity to begin with – mobile may very well be the market that stands to gain the most from HSA in the first place. Any word on the software side? Until it's integrated into the major frameworks and API's (.Net, Java, DX, Android, etc), I don't see much uptick. I think a large reason for that is because HSA is currently only available on AMD products that are uncompetitive CPU-wise with the competition. Developers, especially ones relying on CPU capabilities*, will only use what they already have, and they're buying Intel CPUs because AMD has been especially uncompetitive in traditional single-threaded CPU performance. Basically I don't think we'll really see HSA software on PC until Zen APUs are a thing...and that's assuming Zen isn't Bulldozer MKII. This comment seems weird. Just to bash AMD. If this is the case then ARM and all the rest are screwed since their CPUs are even slower. "This comment seems weird. Just to bash AMD. If this is the case then ARM and all the rest are screwed since their CPUs are even slower." It's not a matter of absolute CPU speed. It' s a matter of how a SW development choice impacts on the market it is destined to. In desktop market, that is under Windows, developing a HSA software means targeting less than 10% of the market. To probably achieve a speed only slightly faster than that achieved with a normal optimized serialized code for Intel processors, which are much more powerful in INT and FP calculations (expecially with the new AVX). In mobile market, if most of the SoC builder are going to create HSA HW, then a SW written for this market is going to hit most of the market with improved speed and, most important, with reduced power usage. So AMD hope to see HSA idea wide spreading in SW development is that mobile market is going to use it, otherwise they will never see a single SW written for the desktop market. It would just be anti-economical for anyone.